A pair of black boots alone on the stage before the start of Mithkal Alzghair’s Solo is a bleak image of displacement that has many connotations. When Alzghair enters the stage bearing a neatly folded white sheet in his outstretched arms, places it carefully on the floor before putting on the boots, the images and gestures are stark but full of meaning. Although Alzghair’s references may not be immediately evident to a western audience, he transfers to the spectator his raw experience through the emotional conviction with which he invests each and every movement. 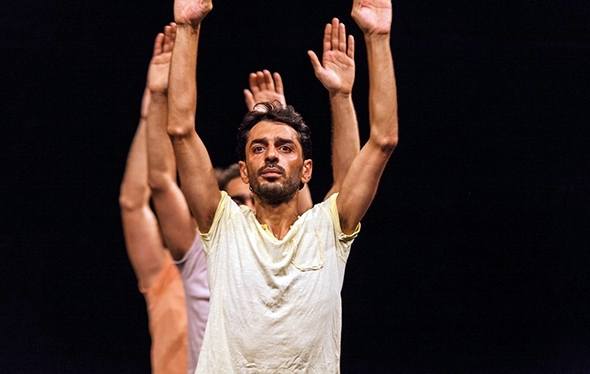 Alzghair grew up in Syria and currently lives in exile in Europe; what he brings to the stage is what his body remembers from its heritage without any overt narrative or political propaganda. In exploring how steps and everyday gestures are transformed by external forms of coercion, Alzghair uses dance as a metaphor for freedom and culture that can be diminished but never erased. His hands behind his back suggest forced restraint, his arms raised above his head denote surrender and his stripping down to his underwear with his jeans around his ankles forewarns of a violence that can only be imagined; as he pivots and falls repeatedly in an attempt to maintain his footing his unbuckled belt thrashes on the floor like a whip. But however repressed and subjugated he may be, he maintains the essential rhythms of the dance throughout. Alzghair connects us to Syria through traces of traditional music and fragments of rhythmic dance steps he and his friends once performed at weddings and other festivities. There are deep, angular steps that surge into the ground to rise up out of it in joy and ecstasy, and small rhythmical foot shuffling like a recitative he maintains throughout Solo; these steps become in themselves an expression of displacement through exile and his unflinching gaze serves to remind us of the pain such upheaval entails. Suddenly Alzghair includes a high military kick that jars our frame of reference; he kneels, bends over with his hands crossed behind him and tries to continue the rhythms on his knees and then in very low, knotted steps until he collapses in a cross-legged heap. He endures and he survives but the past leaves a diminishing trace on the present; now that he is outside his Syrian cultural context, he has to explore the act of physical recollection of what has been left behind. Despite its air of fragility, Solo is a muscular protest against cultural oppression and its concomitant displacement and serves notice that it is culture that defines people before any notion of politics. The eloquently somber lighting (by Séverine Rième) and everyday clothing are in the same register for Trio, which follows without a pause, resuming the notions of Solo with dancers Rami Farah and Samil Taskin. Alzghair introduces into the reality of displacement the mutual support among a group of friends. The Syrian conflict again becomes the invisible backdrop to the fragility of human life, to notions of home, comradeship and memory that fulminate quietly throughout the work and question our sense of comfort. Yet at the same time the three men embody a profound yet humble humanity that is uplifting. The shuffling foot rhythms of Solo are repeated here but are intimately felt like a bond between the three men rather than performed. To simple dance patterns and solos are added sequences of sotto voce clapping and the linking of arms. The cloth Alzghair brought in for Solo is unfolded by Farah and Taskin and gripped in their fists above their heads, a sacred memory of home, perhaps, against which we see only the men’s shadows. They continue to shuffle in subtly changing patterns creating a sense of uncertainty and trepidation as they weave in and out of the light as if avoiding attention. Alzghair breaks into a folk step that the other two follow and then the trio reforms until the invisible force of coercion makes itself felt once again in ominous gestures of kneeling and collapsing, while the stripping of their shirts gives the men a heightened sense of vulnerability. But the feet keep up the folk rhythms whenever possible as a metaphor for keeping alive in a seemingly hopeless situation. The way Farah makes a ritual of folding up the t-shirts and the white cloth speaks longingly of absence and loss as Alzghair and Taskin whirl around the stage and spin off, a momentary sense of elation and freedom before the three join together on another arduous journey. In terms of gesture there is little to differentiate between movement transformed by external coercion and that transformed by one’s own arduous exertion. The men drop like ripe fruit but help each other up and continue, now dispersing slowly to the edges of the diaspora of the stage as the light dies with a sense of interminably drawn-out time and ineffable space engulfed in crushing silence. This UK première of Displacement was produced by Sadler’s Wells as part of the Shubbak Festival of contemporary Arab Culture.